How to Determine What Kind of Airless Paint Sprayer Should I Use? Identifying the correct airless paint sprayer hose for your business is contingent on your answers to some basic questions. Once you discern what kind of machine you actually need, then you can contact a few dealers and have an intelligent conversation about your finances and your expectations. The information below can help guide you through that discernment process. 1. First, establish what kind of material you will be spraying, and how much of it. This could be a tricky thing to establish, because you will be planning for the jobs you intend to be doing three or four years from now. Every material you spray requires a certain tip size, and each sprayer has a certain range of tip sizes it can accommodate. The volume of material you plan to spray will simply decide how large and durable the unit should be. 2. Next, what is your preferred power source? If you normally work outside or on construction sites, a gasoline powered airless paint sprayer is a sensible option. However, if you normally work in enclosed spaces or around finished structures, an electric unit may be a more convenient option. 3. Then, think about how you plan to use the sprayer. Some airless paint sprayers accommodate only one gun, others can accommodate two. The amount of available hose can also be an issue, as well as a number of other bells and whistles. Each sprayer comes with its own “package”, so you should decide ahead of time which features you are willing to pay for, and which ones you could do without. 4. Finally, how do you intend to finance it? 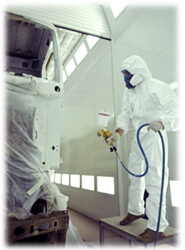 An airless paint sprayer can cost under $200 or over $10,000. As with any equipment, you will want to buy the best model possible, so if you can afford $10,000, that's where you should look. On the other hand, taking on a debt in this economy should not be done lightly. If you are only able to finance around $1000, that will simplify your search considerably. Keep in mind that many reconditioned sprayers are available at considerable discounts. If you already know the size or capabilities you need, then finding the right reconditioned unit will be easier. Also keep in mind that machines can always be leased. While this may not be the most economical option, it may free up some cash flow for other important things - like payroll, for instance. An equipment investment is the sign of a growing business. Investing in the wrong equipment, though, or in equipment you really can't afford, seldom helps anyone. Identifying your needs and your options before you talk with the sales representative will make this transaction smoother for everyone involved. Having done your homework, you will be able to go straight to what you want and communicate what you can pay. This should enable you to come back with the right airless paint sprayer for your business. Now go paint something!